The Introduction to Mindfulness class is based on the 8-week Mindfulness Based Stress Reduction (MBSR) Program, founded in 1979 by Dr. Jon Kabat-Zinn at the University of Massachusetts Medical Center. Cost: Free. Please register above. We explore mindfulness through practices of meditation, body-awareness and mindful movement in this class. 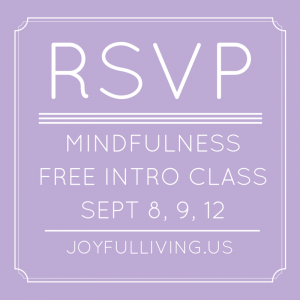 This class is a prerequisite for the 8-week Mindfulness Based Stress Reduction (MBSR) Program. Participants will have the opportunity to sign up for the 8-week classes starting September 15, 16 and 18, 2015 in Austin that include a full day Silent Retreat (24 hours of instruction). The fee for the 8-week class is $450 with sliding scale scholarships available. Who can attend: Anyone interested in exploring mindfulness practices for stress reduction. No prior practice is necessary. All exercises will be modified to meet the individual needs of participants. What to wear: Comfortable clothing that allows for gentle stretching and comfortable sitting. Options to sit: Chairs and back-jacks (for supported floor seating) will be provided. If participants already have a meditation practice for which they use a meditation cushion, they are welcome to bring it along. This program is taught through an 8-week class that meets once a week for 2 hours. Participants are also required to attend a day-long silent retreat that is teacher led. In the 8-week program, participants are trained in mindful meditation that helps them explore their reactivity and response to stress. In addition, practices that explore the mind-body connection are explored through mindful movement and body-awareness. The practices of developing stress hardiness through training in kindness and self-compassion and training in mindful communication are also offered. Stress – caused by work, school, family, financial, illness, aging, grief, and several other factors of daily living. Medical conditions – including chronic illness or pain, high blood pressure, cancer, heart disease, GI distress, skin disorders, and many other conditions. Psychological distress – including anxiety, panic, depression, fatigue and sleep disturbances. Prevention and wellness –including health enhancement and learning a better sense of balance in life. This program is offered as a complement to traditional medical and psychological treatments. This workshop gives a very brief introduction to the practices. An ongoing commitment to deepen the understanding and practice of the five foundational tools is encouraged and is required to reap the full benefits of this program.